Have you ever wondered what it would be like to be famous? Or to date a celebrity? We have a simple solution for anyone who’s ever tried to imagine how they’d handle fame: Borrow our dog for a day. Not even a day – just an hour – and try to walk down the street. Unofficially, the Zoom Room does have a mascot: Clyde. A big behemoth of a Komondor. 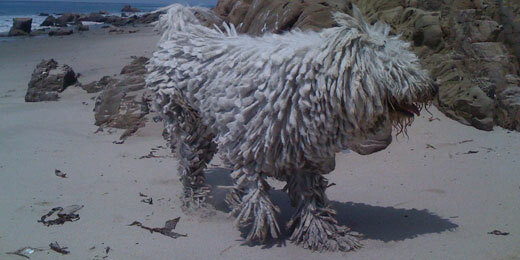 There aren’t many Komondorok (the plural form of Komondor) in the U.S. – so it’s a sight most folks have never seen. The place many people have seen a Komondor was gracing the cover of Beck’s album Odelay, many years ago, which depicted a giant white dreadlocked mop of a Komondor doing a bit of floppy mid-air dog agility. Does his hair do that naturally? Clyde is a chick magnet, a baby magnet, a dog-lover magnet, a camera magnet, and if magnets were capable of snapping photos with their iPhones, he’d even be a magnet magnet. Here’s a statistic: we once tried to walk Clyde the roughly seven blocks from one end of Lincoln Road to the other in Miami Beach. We didn’t stop to visit any shops. How long did it take us to walk seven blocks? Slightly over an hour and a half. You’d think we’d be used to it from rush hour in L.A. But posing for Pawparazzi (not us ourselves, just our dog celebrity) makes the 405 freeway seem like a zoom through an agility tunnel. In the meantime, if you do spot Clyde in one of his favorite spots around town, feel free to stop and say hi. We actually don’t mind. And Clyde loves it. He loves everything. Dogs are great.